The Speyside episode. Patrick Leclezio toasts the highlights from a tour to end all tours. First published in Prestige Magazine (October 2014 edition). I remember my first trip to Scotland like it was yesterday – partly because if fell over 11 September 2001 (I heard the news at a little pub on the banks of Loch Ness), but also, more cheerfully, because it introduced me to the world’s ultimate whisky destination. The area on either side of the Spey River in the Highlands of Scotland – a span located approximately between the cities of Aberdeen and Inverness – is undoubtedly the most special place in the whisky world. Scotch whisky divides its formidable universe into five official regions: the Highlands, the Lowlands, Islay, Campbeltown, and Speyside. The latter, the object of my current affections – colloquially known as Strathspey, is by a Scottish country mile the most prolific, being home to some 49 malt whisky distilleries. I was recently gifted the privilege of return visit, as part of a tour to celebrate Glen Grant Single Malt’s just-launched 50YO. It was a trip to remember. Here are a few highlights of the region for the whisky pilgrim. May the dram be with you. Their website claims 750, their staff told us that it’s now over a thousand. That’s the number of whiskies they offer at their bar (The Quaich), and whatever the precise figure might be it’s a lot – something about shaking a stick comes to mind. The hotel, despite its renown, or maybe because of it, is completely unobtrusive – the generic “Hotel” lettering being the only signage advertising its presence. There’s a deep sense of rustic Scotland that resides here, from the copper light fittings at the front door, to the preponderance of wood: wooden bar, wooden chairs, tables, and shelves – all that was missing was a couple of casks. It’s an undeniably special place at which pause in a journey to enjoy a few drams. Ironically enough our barman was South African, more ironic still, he’s the son of one of the owners of Wild about Whisky, South Africa’s answer to the Craigellachie Hotel. It’s a small and strange world. The Monster might be a laughable concoction, but you’ve got to give it to those canny Scots – they’ve taken an ordinary, albeit picturesque, lake and transformed it into a tourist attraction of global repute. The upshot is that tour boats ply the waters regularly, transporting the gullible, the cynical and all paying customers in between over this “mystical” expanse of water. And so it was that I found myself lazily basking on a deck, sipping whisky with my fellow tour-mates in the soft Scottish sunlight, and watching castles, ruins, and other pleasant sights of little consequence as they drifted past. In short it’s a brilliant way to spend an afternoon – just for a lark. Here too, as almost everywhere else in Speyside, the connection to whisky is never far away; the loch’s waters owe their murkiness to dissolved peat, the same stuff that’s burnt to impart a distinct smoky flavour to certain whiskies. The stills, the mash tuns, the washbacks, and even the quaint stone buildings are much the same as at other distilleries in the area, but the spectacular gardens, set in a glen carved out by the Black Burn, ensure that the distillery lives in a league all of its own. We meandered through them at leisurely pace, stopping for a picnic under a pagoda, before eventually reaching the “Dram Hut”, a yonks old structure accommodating a whisky safe fixed into the rock – not some sort of decorative spirit safe mind you, an actual metal strongbox containing whisky (you can’t make up this stuff!) – where we were treated to a few drams of the Gordon & MacPhail Glen Grant 25YO. This whisky dates back to an earlier era, some of it being as old as 37 years, when the distillery still made a peated malt, so it seemed like quite a fitting drink to facilitate our pursuit of a deeper acquaintance with the place – and the more of it we drank, the more facilitated we felt. The Scots are not known for their food but it turns out that some of it is pretty damn good. Aberdeen Angus, the breed of cattle exalted in Argentina and other meat-loving locales, originates from nearby, and quality steaks of this fine beef are in ready supply all over Speyside. We did not desist in our appreciation. Likewise we filled our boots with local scallops, Scottish salmon – smoked over wood chips made from old whisky casks – and most notably, haggis, served in the traditional manner, with neeps (turnips) and tatties (potatoes), both mashed. The customary breakfasts in these parts – similar to the English version but with the addition of baked beans and black pudding – is also well worth trying. And to those apprehensive at the thought of haggis and black pudding let me say this – don’t think about it, just go for it, they’re both delicious. 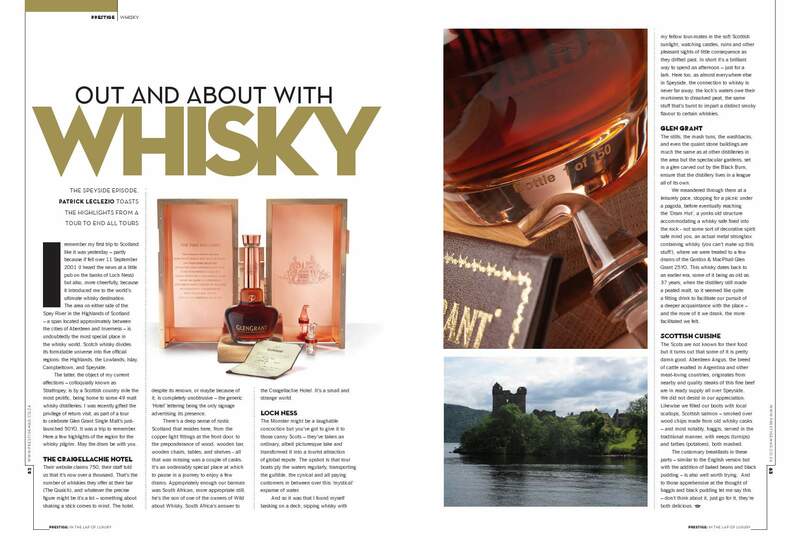 This entry was posted in Whisky column and tagged Glen Grant, Loch Ness, Scotland, Speyside. Bookmark the permalink. The missus and I hiked the Speyside Way a few years ago. We managed to squeeze in trips to the Aberlour and Glenfiddich distilleries, and ate tremendously well every evening. It was a grand trip! Thanks for the comment. I’ll be covering the notable walks in Speyside in an upcoming piece, so this is useful information.